Hello ! I'm back today to share my DT project for the start of the Stamps and Stencils challenge. I'm the host of the new challenge and I've chosen Spritz, Splatter and Smoosh ! All of these terms I'm sure are all familiar to you so interpret them in any way you like as long as you include some stamping or stencilling ! 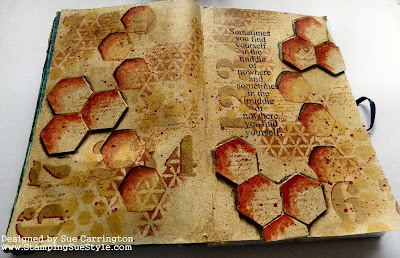 The starting point for this journal page were these chipboard hexgons that I'd got out for another project then changed my mind. 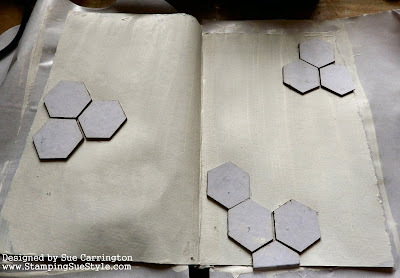 The journal pages were first given a coat of Gesso then I glued the hexagons in place. I used some Haystack Fresco Finish and coated the whole page then started to stecnil using Autumn Fire and Brown Shed. 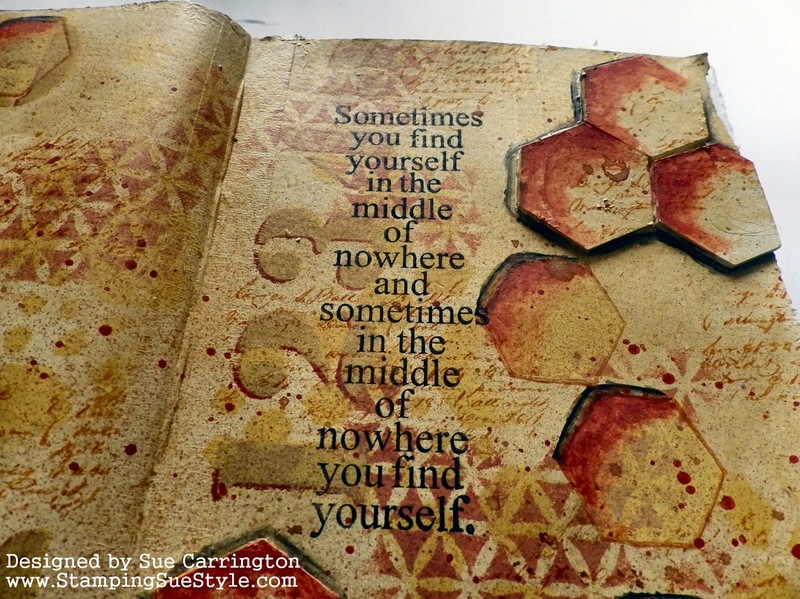 I used my favourite TCW large number stencil and did the bumping technique. 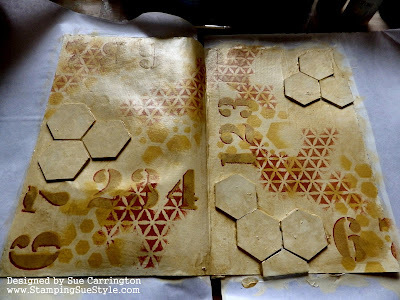 Then I added some satin glaze to Gold Fresco Finish and painted it over the whole page and wiped it back after a minute or so. It leaves the most beautiful sheen which I think you can just about pick up on the above photo. 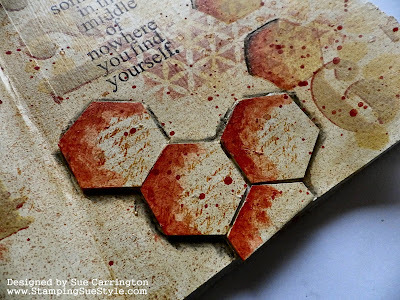 I stamped some hexagons from the JOFY 30 stamp set and then painted them with the same colours as the 3D hexagons. To add some depth I used a Stabilo pencil around the edge of all the shapes and with a damp brush blended it to create a shadow. 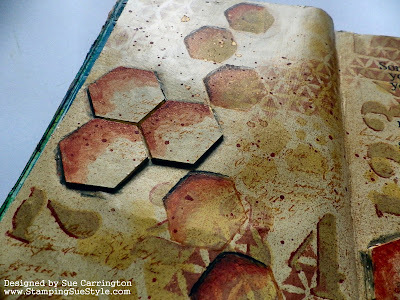 I used a Tim Holtz script stamp and used Orange Blossom Archival ink and stamped onto the raised hexagons and also onto rangdom areas of the page. 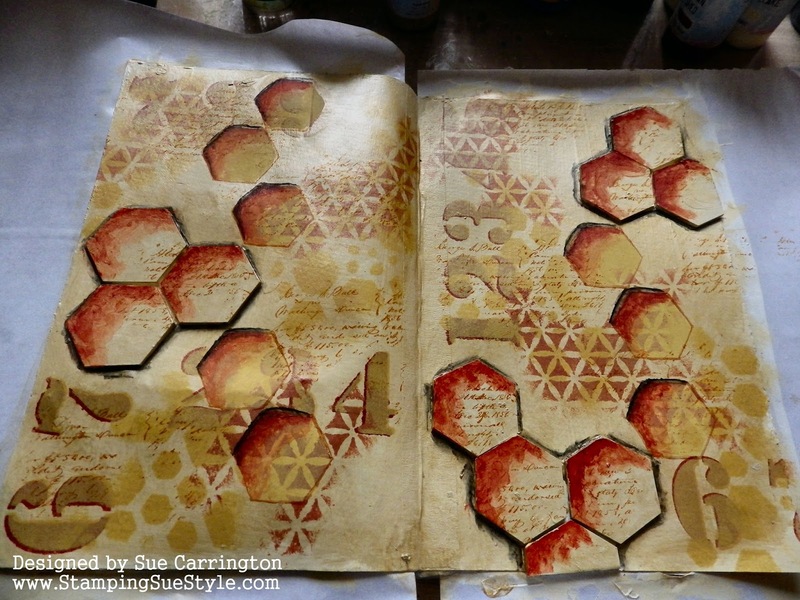 I then spritzed the page using a Lindy's Stamp Gang spray. 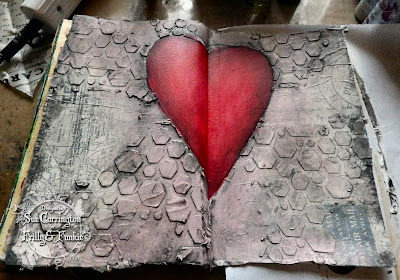 I decided the spritz wasn't enought so I watered down some Brown Shed Fresco Finish and splattered it over the page, much better ! 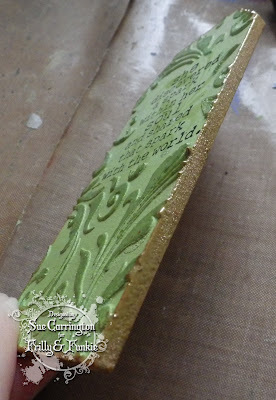 You can see the splatters on the above page and also the sheen from the gold glaze. The spritz and splatter shows up well on the above photo. 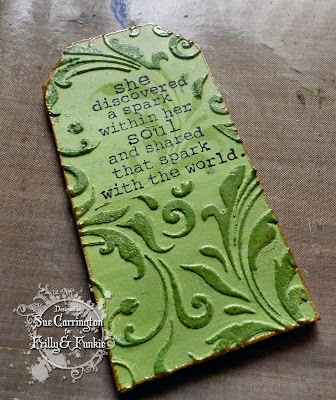 The fabulous sentiment is another Yvonne Blair stamp and this one really struck a chord with me. 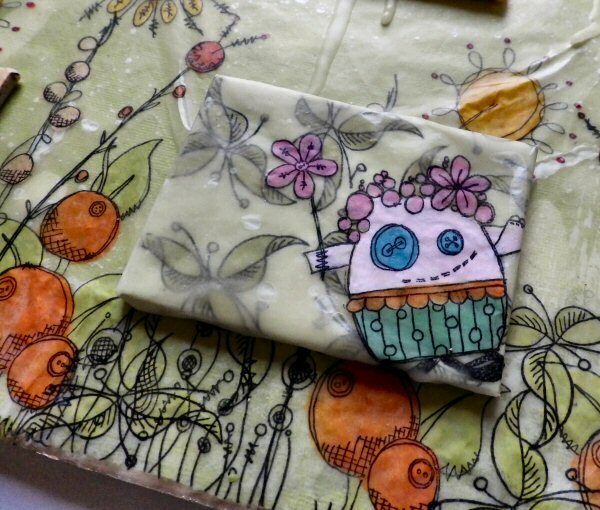 I hope you can find time so Spritz, Splatter and Smoosh with us this month ! 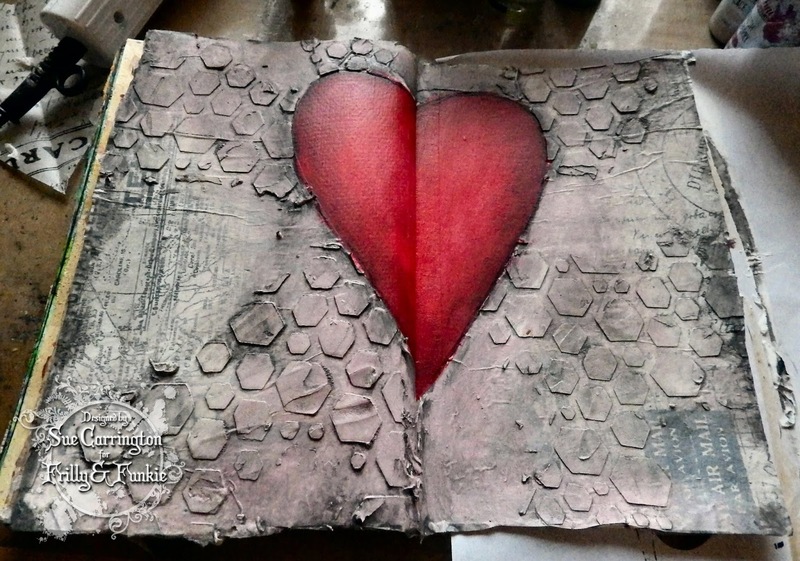 For lots more inspiration do make sure you hop over to the Stamps and Stencils blog. 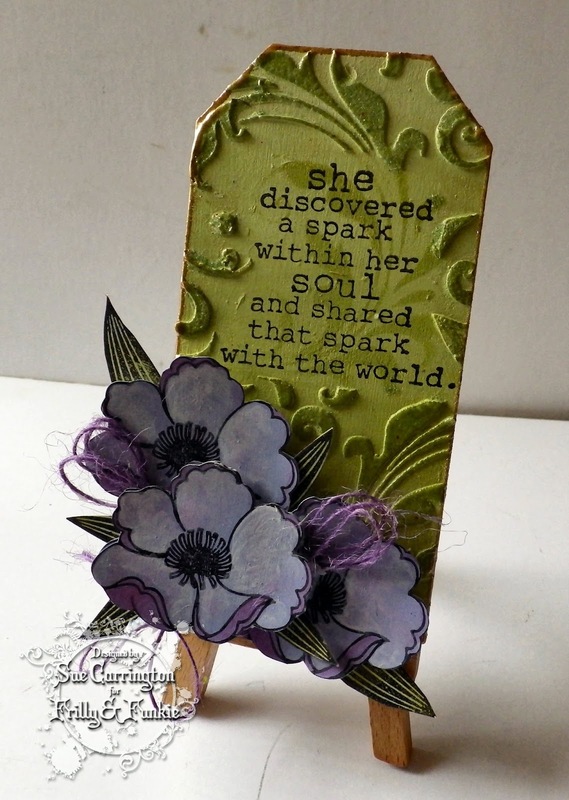 For this one you need to make a vintage or shabby chic project of your choice and remember to include some embossing. Use your favourite embossing methods (wet, dry, heat, or any other techniques you want to share) - just enjoy your embossing! 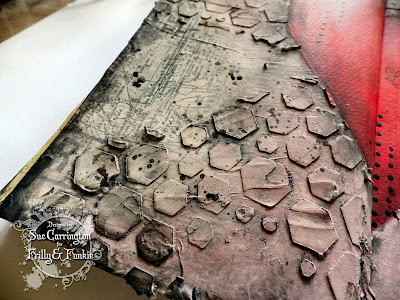 The problem with this challenge was I just couldn't make up my mind which kind of embossing to do! I decided to use an MDF tag shape that I've had for a while. 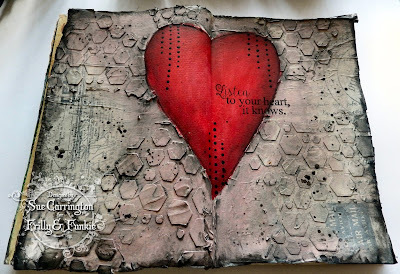 I painted it first with Gesso then I stamped the sentiment onto a piece of paper and cut out the shape around the words. I placed the piece of paper onto the tag then used the Tim Holtz stencil and Ranger Texture paste and spread it over the top. When the piece of paper was removed it left the perfect shape for the text to be stamped later. After the paste was dry I painted over the whole tag using Fresco Finish paints creating a gradient of colour. 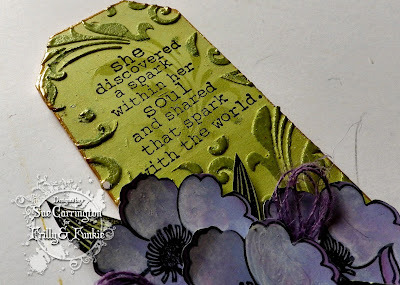 Then I replaced the stencil and pressed Versamark ink over the top, removed the stencil then sprinkled Lindy's Stamp Gang embossing powder over the top. 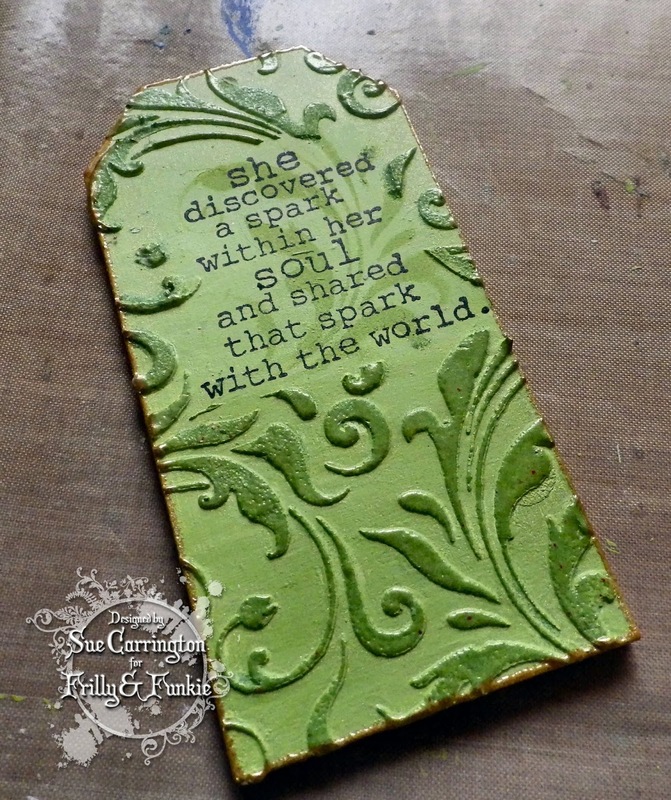 The powder melted beautifully over the texture paste ! 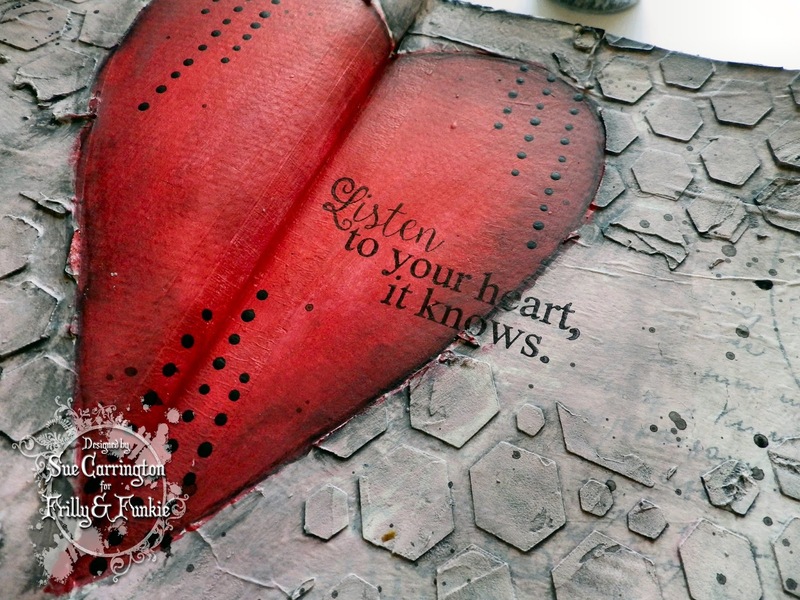 I used the same stencil and added some stencilling to the area without paste then stamped the sentiment. I pressed the edges onto the Versamark pad then used Lindy's Stamp Gang embossing powder again. 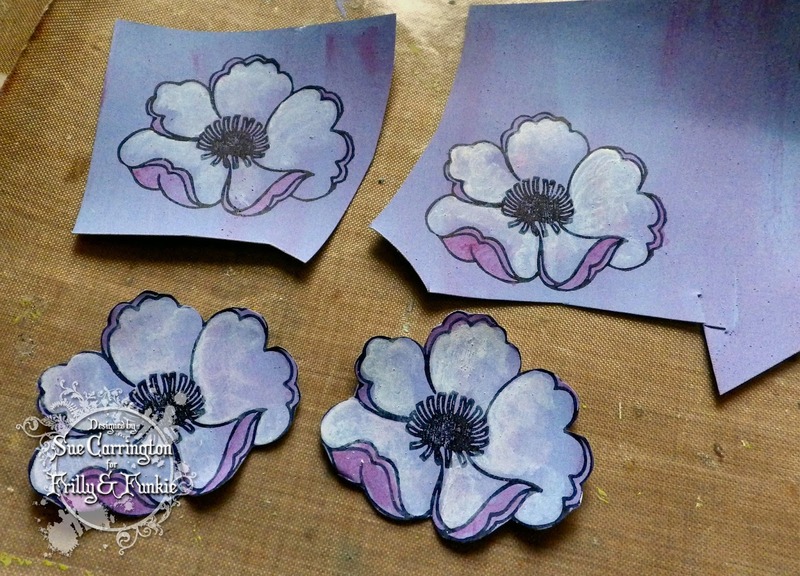 I love the flowers from the Wendy Vecchi Artful Life stamp set. I painted some white card with Fresco Finish paint then used Snowflake Fresco Finish over the top which knowck back the colour. 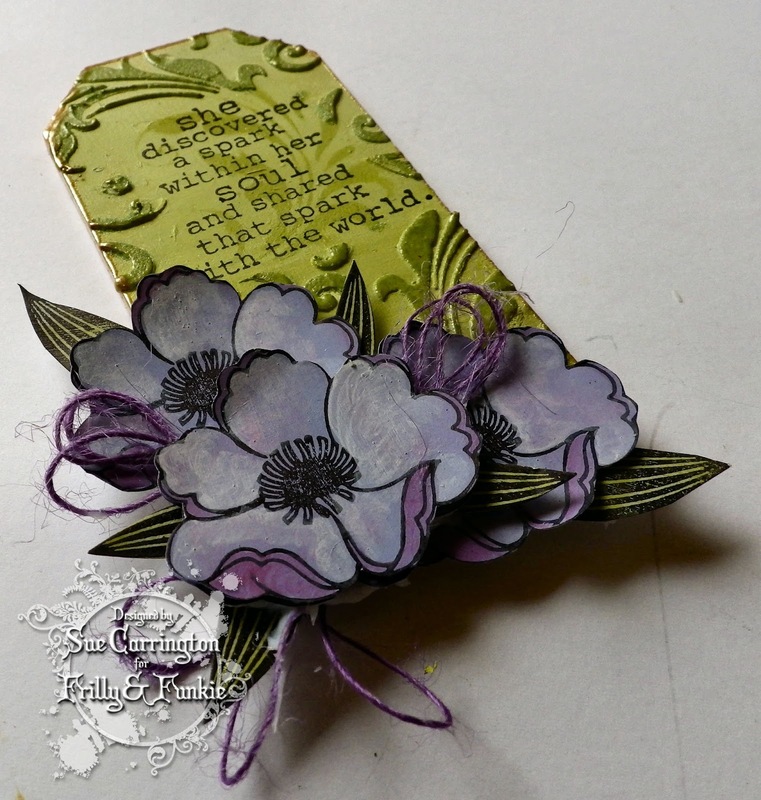 The flowers were cut out and then layered onto the tag. 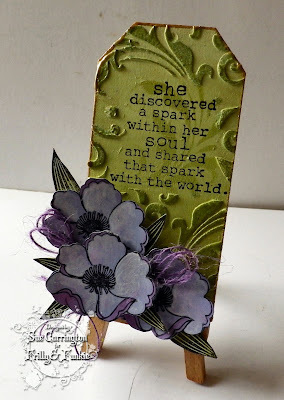 I stamped some leaves from the same Wendy Vecchi stamp set and cut them out and arranged them among the flowers along with some pieces of coloured twine. The sentiment is by Yvonne Blair, if you've not seen any of Yvonne's stamps you really need to check them out in Linda's Funkie Junkie Boutique, they are all fabulous ! I hope you get chance to join us for this challenge and do make sure you hop over to Frilly and Funkie to check out the rest of the DT's fabulous projects.